NASHVILLE, TN — Along with the themes of empowerment, unity and activism, there was another important message in the Women’s March 2.0: vote. The 2018 march serves as a launching point for action throughout the year, with the goal of increasing voter turnout during midterm elections and inspiring women to take on political roles. “We’re engaging in a lot of voter registration, civic engagement work, all geared towards Women’s March 2018 national agenda which is #PowerToThePolls. We have a very ambitious goal of registering 1 million new voters this year across the country,” said Darlene Leong Neal, Director of Women’s March Tennessee and member of Power Together Tennessee. 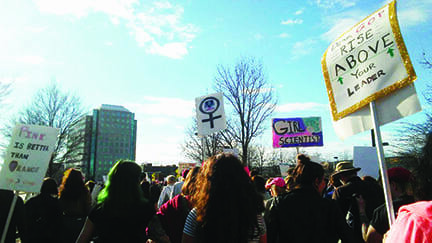 New to the march this year was a variety of workshops aimed toward activism, politics and providing women with the tools to run for office. “I used my voice as a rapper, actor and artist and activist to promote what we’re doing,” said Black Lives Matter Memphis chapter founder P. Moses about her seminar on using art to create change. “The goal was to inform, educate and organize and to encourage and enlighten people when they leave out the room to make themselves an artivist.” She encourages women entering the political sphere to vote and find social justice organizations to donate time or money to. “If you don’t use your voice, you’ll lose it,” she said.